I have a strong liking for Pelargoniums (which I will call Geraniums from now on). They are still producing lots of colour and variety late into October. Because we suffer strong winds and early frosts up on the Pennines of Yorkshire I am in the process of protecting the varieties I am keen to keep through winter. 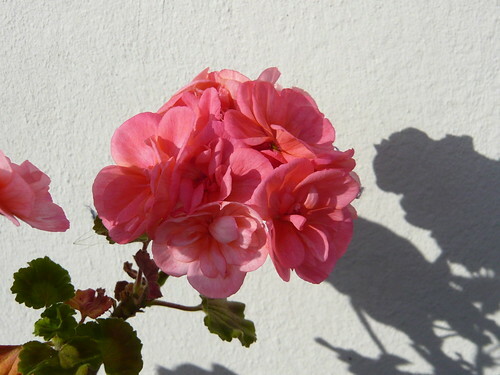 Geraniums originate from South Africa and are tender in our UK climate. 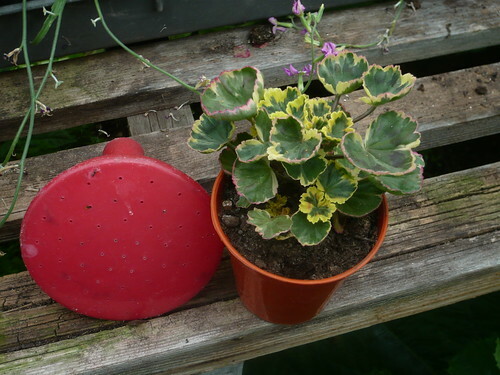 Geraniums do not like damp humid conditions coupled with low light levels in winter. Select the best varieties of Geranium plants that you wish to preserve over winter. Zonal Geraniums are going to be cheap and plentiful next year so if space is limited they may be the ones to sacrifice. I am taking late cuttings of my chosen Regal and scented Geraniums in case the stock plant fails. I also took some earlier cuttings in August. Do not use hormone rooting powder as this tends to attract black rot. Keep the cuttings in a light frost free spot. For small cuttings I put 3 or 5 to a pot of well drained compost. The host plants need to be tidied up with any brown or nibbled leaves removed. I have pruned long stems to restrict the plants and provide cutting material. Keep the plants frost free and on the dry side over winter. If they are kept in a centrally heated house they will need some water and may repay with a supply of flowers. Strong light is not essential but they will prefer some natural light. In spring a weak feed and more light will revive the slumbering plants. New growth can provide stock for many more cuttings. Regal Geraniums once called Pelargonium domesticum, P. Cucullatum or P. grandiflorum are showy flowering plants at their best between April and June. Named varieties to look out for include Black Knight, Bridesmaid, Caribrooke, Marylyn (above)Wooton and Lord Bute.The velvety textured petals can combine to make large flowerheads and look stunning in a pot or container. The growing habit is looser than Zonal geraniums. Ivy-leaved geraniums are trailing plants best known in hanging baskets and from the balconies of Swiss Chalets. The colour range is not as wide as that for Regals but the volume of flower over a long summer make them desirable plants. Fancy Leaved Geraniums are sometimes called ‘show-off’ Geraniums and as you would expect have a variety of leaf colour that make them attractive in the house or as an edging plant. There are also many scented leaf geraniums with a variety of like citrus scents. 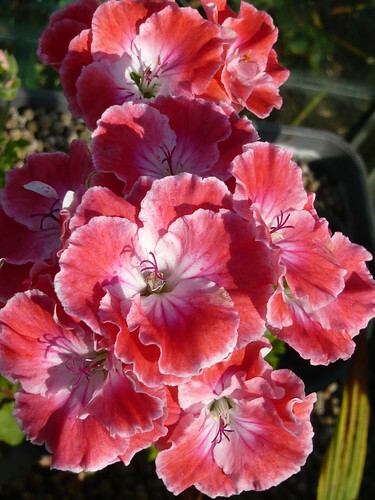 Pelargonium Endlicherianum or the Turkish Pelargonium is more hardy than other Geraniums. They produce large bright pink flowers in early summer. They have succulent roots and need very well drained, rocky soil in a protected spot in full sun. The round, greyish-green leaves and pretty flowers make them an excellent plant for the rock garden. Dwarf and Miniature Geraniums are fascinating plants that have all the features of normal geraniums but on a smaller scale. The plant below is now flowering with pink petals on the typically geranium like inflorescence.